Showing just how callously this officer thought he was above the law, he was caught on duty, in uniform, selling opioids from his own patrol car. Bonifay, FL — Over the weekend, a person whose job description involves kidnapping and caging people for possessing or selling substances deemed illegal by the state—was found possessing and selling substances deemed illegal by the state. What’s more, he was doing it right outside of an assisted living facility while on the taxpayer’s dime. 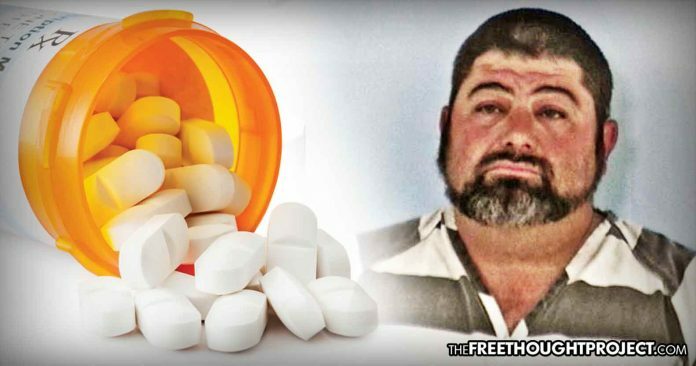 The officer, Dwayne White, 48, with the Bonifay Police Department was in his patrol car, on duty, and in uniform selling opioids on Saturday when the Florida Department of Law Enforcement arrested him. According to the FDLE, it began its investigation into White at the request of a neighboring sheriff’s department, Holmes County Sheriff’s Office. As WTXL reports, earlier this month, FDLE agents made a controlled purchase of opioid tablets from White. At the time of the purchase, FDLE said White was selling the drugs out of his marked patrol vehicle, while in uniform, and was using his personal cell phone to facilitate the drug deals. White has since been charged with selling a controlled substance within 1000 feet of an assisted living facility and unlawful use of a two-way communication device. While police officers selling drugs is certainly not an isolated incident, the fact that this officer was doing so from his own patrol car, while on duty and in uniform, is noteworthy—but not too rare. Earlier this year, TFTP reported on a similar story out of New Jersey, in which a cop tasked with fighting the drug war was actually contributing to the opioid epidemic. A police officer in New Jersey was arrested by the FBI after he was caught selling drugs out of his patrol car and near the police department, in a sting set up by undercover agents. In another case out of Indiana, TFTP reported on Officer Donald Jordan who was arrested by the FBI after an investigation of several months revealed that he was selling drugs while on duty. The local police department was tipped off about the issue and surprisingly, the local police chief actually contacted the FBI to have them conduct an investigation. Usually, this is the sort of issue that is swept under the rug by police departments, so this is an extremely rare occurrence. In another case from 2015, Perry Betts, one of the most corrupt narcotics officers in the history of the Philadelphia Police Department, was fired for selling drugs, rehired and then fired again. His rehiring came after he was acquitted in a federal corruption case, in which he was accused of 47 different charges including extortion, robbery, kidnapping, and drug dealing. According to a U.S. government study, released by the National Center for Health Statistics, drug overdoses in the U.S. have increased by 23 percent between the years of 2010 and 2014 and cops like White are contributing to this problem.